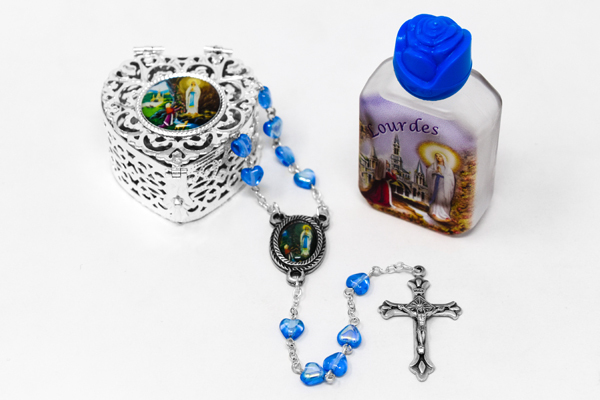 DIRECT FROM LOURDES - Beautiful Lourdes Heart Glass Rosary Gift Set. Beautiful Lourdes Heart Glass Rosary Gift Set. > Lourdes glass rosary with 5 mm blue heart beads, the rosary measures 18 inches approx. > Silver heart rosary box depicting the apparitions Dimensions: Height 2.5 cm, Width 4 cm. > Bottle of Lourdes water (design may vary from that pictured).